The county deployed ArcGIS 10 for Server to drive the new site, enabling it to manage the enormous database and integrate multiple map services. The LA County Solar Map offers more than 100 million points for solar potential on rooftops and calculates solar radiation every five feet. GIS aids the Solar Map to cover more than 2,200 square miles and include all 88 cities. California looks to an energy future that includes renewable resources. Los Angeles (LA) County has abundant sunshine and is encouraging people to capture its energy by installing solar energy systems. A system's effectiveness to generate electric energy is dependent on the size and number of solar panels installed and how much sun reaches them. Since 2009, the LA County Solar Map has been an online map service that provides solar value analysis for commercial and residential buildings in the county and helps property owners make informed solar installation decisions. 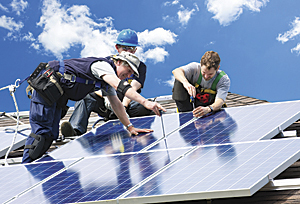 Installing solar panels on a Los Angeles rooftop. 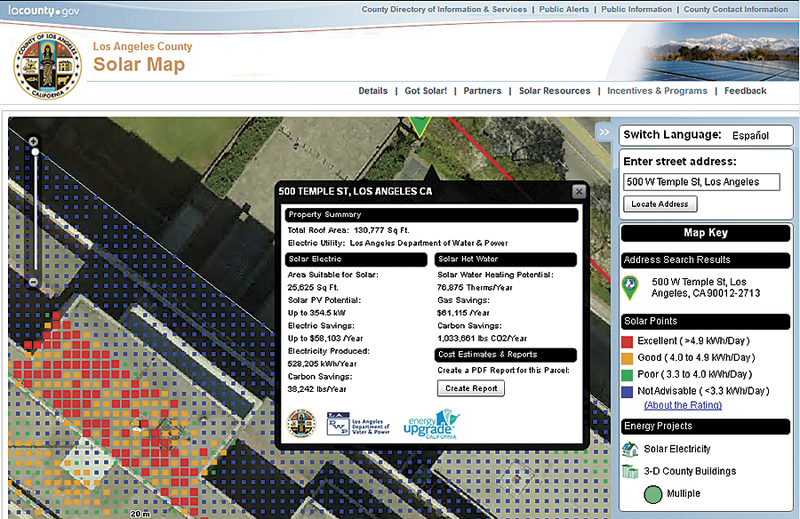 Relaunched on Earth Day in April 2011, the LA County Solar Map (solarmap.lacounty.gov) is a simple, elegant map that generates sophisticated solar calculations for any building in the county. The service provides a detailed model of solar photovoltaic potential and accesses existing aerial imagery and data from the Los Angeles Regional Imagery Acquisition Consortium. Via the online map interface, anyone can select a location, see aerial imagery of rooftops and color-coded dots indicating the amount of direct sunlight hitting each portion of a selected roof, and perform analysis essential for making solar installation decisions. Available to everyone, the portal typically gets between 50 and 100 hits per day but has the capacity to serve many more people as demand for solar energy alternatives grows. LA County geographic information officer Mark Greninger became interested in solar mapping because he wanted to put a solar panel on his own roof. He found he had to do a lot of research to understand his risks, rewards, and return on investment. Thinking that there must be an easier way, Greninger researched how other cities had approached the problem. He came across the San Francisco Solar Map model and looked into developing a similar application for LA County. While looking at the feasibility of a solar map project, Greninger found that the LA County Internal Services Department (ISD) Office of Sustainability was already developing programs to support energy efficiency and solar installations. He partnered with ISD to apply for a County Information Technology Fund grant to implement the project. The Chief Information Office provided the technology expertise, and the ISD Office of Sustainability coordinated county support and policy development. Starting in late 2010, Greninger and Critigen began working on the next generation of the site, with advances in technology that would make the site cleaner, faster, and more robust. Greninger wanted the updated map to be simpler and more intuitive to use while being faster and able to handle high demand to show rooftop potential, pinpoint optimal panel placement, and quickly answer value questions. LA County Solar Map covers more than 2,200 square miles and includes all 88 cities in the county and unincorporated areas. Detailed solar modeling of such a large area requires a massive database that on the previous platform was unwieldy and impossible to display. Solar Map shows rooftop suitability for solar panels and electric and gas savings per year. Red indicates excellent, and blue indicates not advisable. The county deployed Esri's ArcGIS 10 for Server to drive the new site, enabling it to manage the enormous database and integrate multiple map services into the content provided by the site. 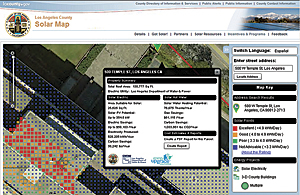 All data was migrated into an ArcGIS geodatabase, thereby making it possible to use existing installations and solar-augmented parcels data countywide. By exploiting the caching capabilities of ArcGIS 10 for Server, as well as limiting the size of the solar data to that of rooftop locations' solar potential, the model quickly accesses data and is highly responsive. The software's Flex API delivers a professional-grade viewing experience. A major step forward in solar mapping, the LA County Solar Map offers more than 100 million points for solar potential on LA County rooftops and calculates solar radiation every five feet. The database contains 250 million individual measurements, including shading from trees, roof features, roof pitch, nearby buildings, and mountains. Each cell grid has been converted to a dot that represents the amount of solar potential for 25 square feet. The user types in an address and instantly sees the aerial image of the property, its roof, and the exact locations on the roof that receive the most sunlight. (It also shows the locations that receive the least sunlight, which is equally important information.) The model can be switched seamlessly between English and Spanish. The user can print out a report showing the details of the selected property. County-owned facilities are represented by six-inch resolution and can be viewed in highly detailed 3D solar models. The website also provides information about utility rebates and tax credits, comparative cost analysis for solar versus utility power, and other solar advantages. The next iteration of the model will include sophisticated solar calculators. These will enable users to draw the location of a potential solar array on a roof and calculate the projected production and various financial benefits using local incentive, utility rate, and insulation data. 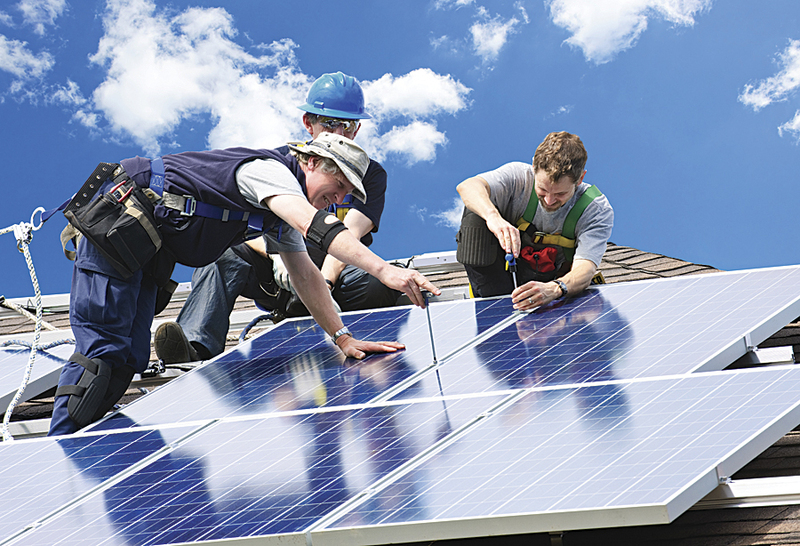 Solar installers get the most direct value from the portal's ability to perform analysis. This reduces installation costs, making solar a more desirable investment. For a nominal cost, they can buy the entire database of assessor information and use it for marketing research. Seeing relationships of solar potential, demographics, years of ownership, savings to clients, and current solar installations data helps these entrepreneurs see the best areas to canvass. Also, solar manufacturers and companies that build and distribute solar cells and modules can use the model to anticipate demand. City governments refer to the model to locate solar energy opportunities in their areas. Additionally, plans are in development to add building energy efficiency calculator tools to the map so that property owners and managers may obtain complete building information on energy efficiency potential, as well as solar energy potential. The accuracy of LA County Solar Map was tested by the University of California, Los Angeles, with findings that showed only a 4 percent level of inaccuracy. Analysis capabilities were independently verified as accurate by the US Department of Energy, which tested an array of monitoring production levels. These findings add credibility to the Solar Map's authority, making it a valid reference for grant and loan applications, scientific analysis, and solar installation. For more information, contact Mark Greninger (e-mail: MGreninger@cio.lacounty.gov). Learn more about Critigen at www.critigen.com or contact Ty van den Akker (e-mail: Ty.vandenAkker@critigen.com). Learn more about ArcGIS for Server at esri.com/arcgisserver.